Bottom fishing provides a great experience when pulling in those fighting fish as they make you work on bringing them up to the ice box. The best part will be the feast you’ll enjoy later. Each fish is unique and generates an immense level of excitement even before they get hooked. Many times as the bait drops, once it hits the bottom you’ll have your catch—start reeling them in. 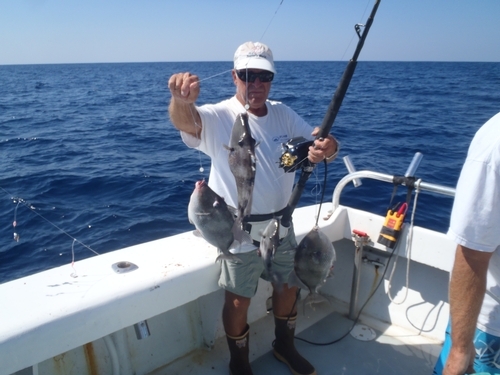 Below are some of the bottom fish we catch and that we’ll head out to find with you. An extremely strong fighter with great endurance. Be ready to reel in one of these and drop your line for another. Quality of the meat is firm texture, white meat with a mild flavor. Extra lean fish. Firm and tender white meat with a delicate and sweet flavor. Firm texture, white meat with large flake and a mild flavor. Extra lean fish. Delicate mild moist white meat that is firm and fine texture. It can be served broiled, baked, steamed, poached, fried or grilled. A member of the rockfish group and has a white and tender meat with a mild flavor. Quality of the meat is firm texture, moist and flaky, white meat with mild flavor. Extra lean fish. Clean white meat carries a uniquely sweet flavor.